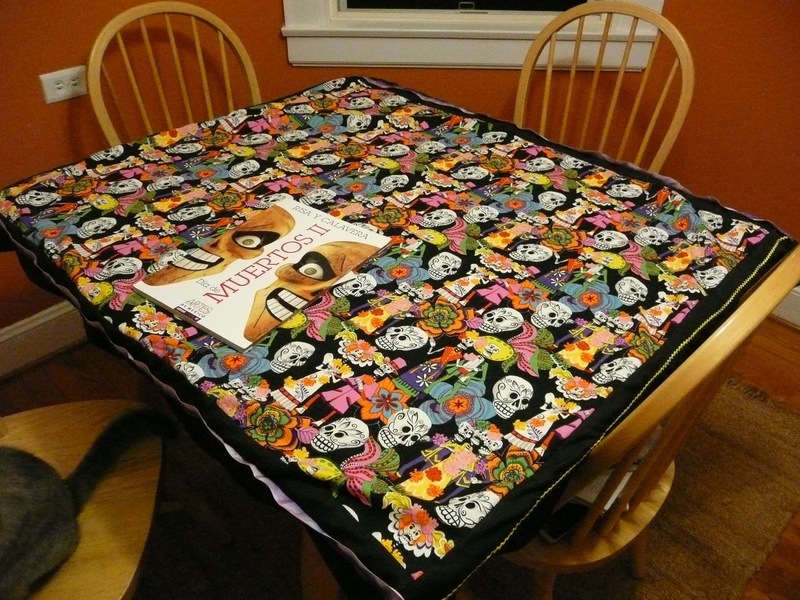 The new tablecloth in the dining room. Today was a busy project day – perfect for a rainy afternoon. Eric worked on refinishing a rocking chair that was a prize trash day find (will post that later) while I worked on this tablecloth and a chocolate and cherry cake. 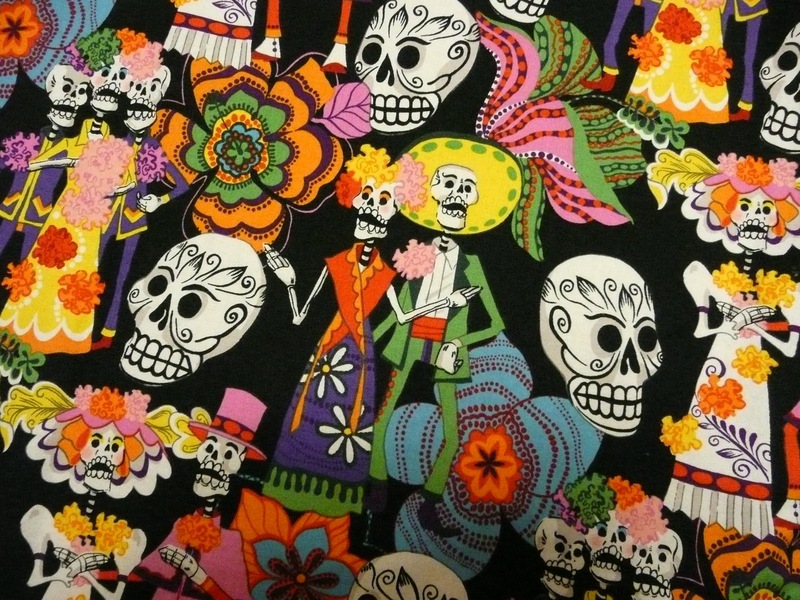 My mom sent me another Day of the Dead print, but I am currently debating what to do with that selection. Will post when my decision is final. I have a few ideas rattling around in my head right now. A close-up of the finished corner with yellow brick-a-brack and violet ribbon. This project was a quick one, just a couple hours. I had a yard of the print and then found a remnant of black fabric. 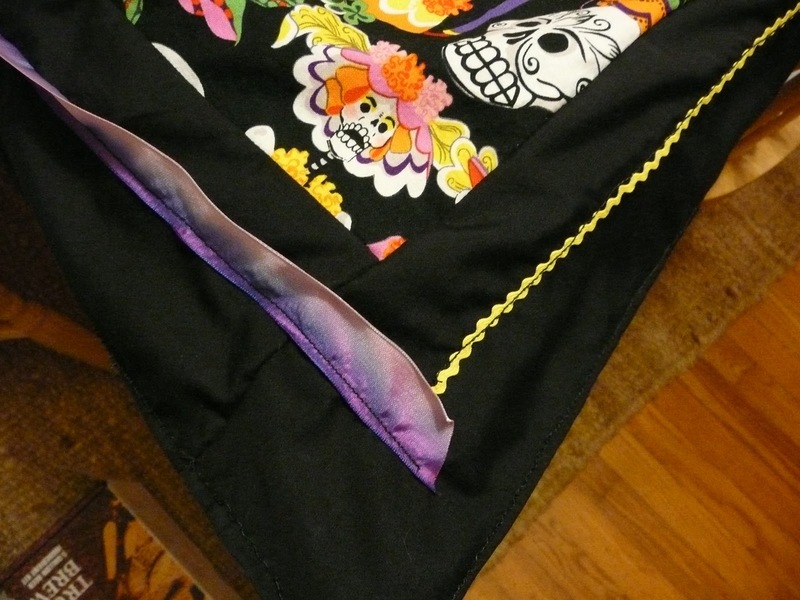 I cut the black into four 5-inch sections, which I then sewed on to the 4 edges. This made a nice edge to which I could affix the decorative trimmings. I seem to be thinking about concrete frequently these days. I got the buyer’s guide to Dwell magazine and am enthralled with the useful and decorative properties of concrete in the home. I find myself wishing we had considered other options for our tiled bathroom floor. 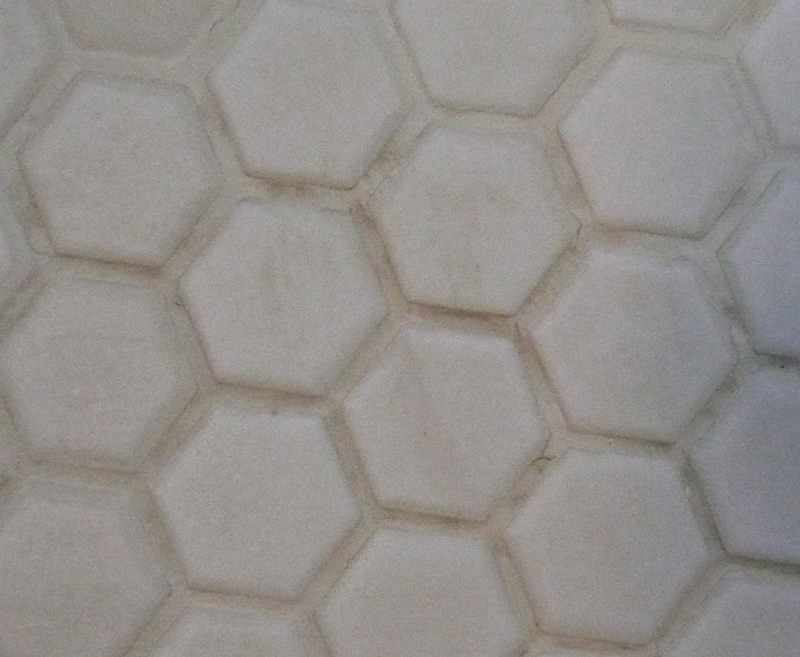 We put in unfinished ceramic tile before we moved into our home. Now, due to lack of glaze, they are and uglier brownish gray color thanks to North Carolina dirt. I will chalk up this poor design and function choice to being new to world of home DIY. 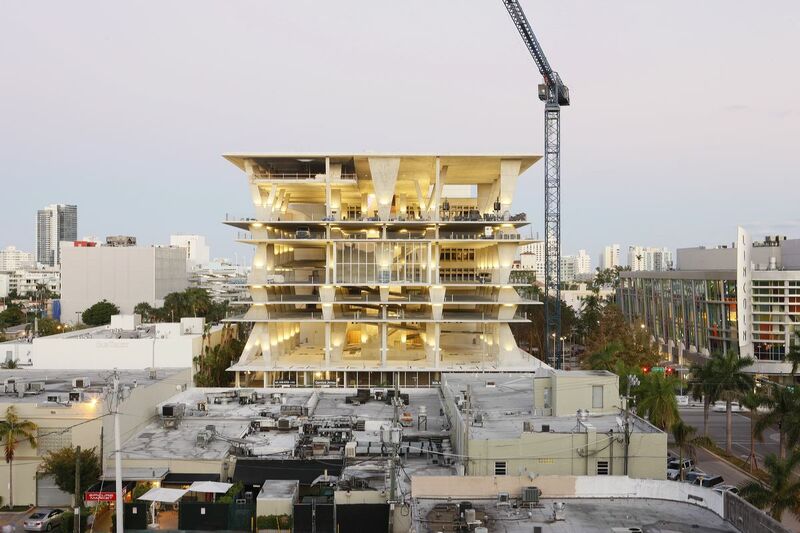 More on the concrete topic, today I read an interesting article in the New Yorker about the new parking garage on 1111 Lincoln Road in Miami Beach by Herzog & de Meuron. The ideas and design exhibited in this building are unique and show a new way of thinking in terms of automobiles and cities. I love the integration of retail, living space, special events space, and innovative use of an older building rolled into a new and progressive piece of architecture. Imagine hosting your wedding in this amazing space – that changes the notion of a parking garage. Who said concrete couldn’t be beautiful? This architecture and design reading leaves me reminiscing of my days in college architecture classes. One of my favorite craft books, Generation T, inspired me to start using my tee shirts for something other than quilts. I have two tee shirt quilts already, though I admit they were both made by my mother. This book offers a great starting point with easy, moderate, to difficult projects. 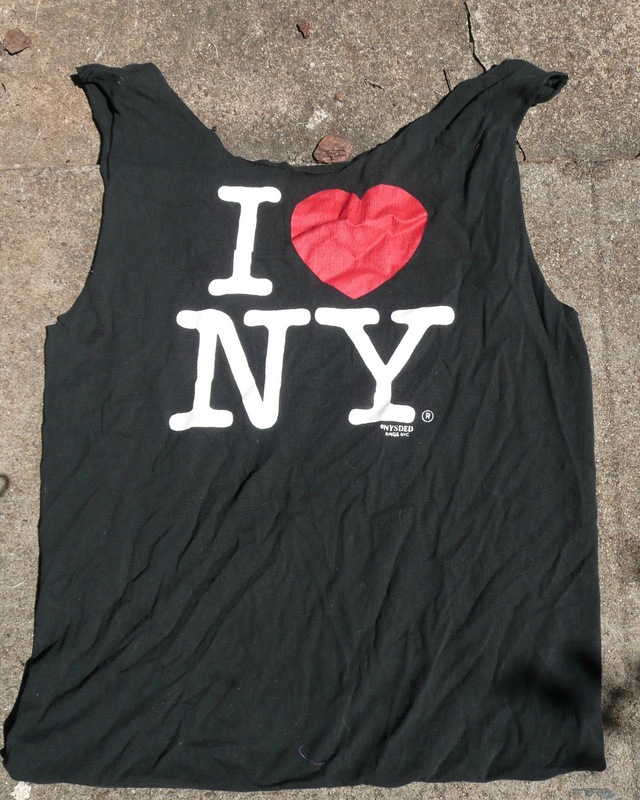 One of my more recent projects from this book was the tee shirt shopping bag, made with the iconic I ❤ NY tee shirt. I ❤ NY tee shirt shopper. So, what do you do when you have a bag of old tee shirts and a few very nice Brooks Brother’s men dress shirts? Side 1 of the pillow. 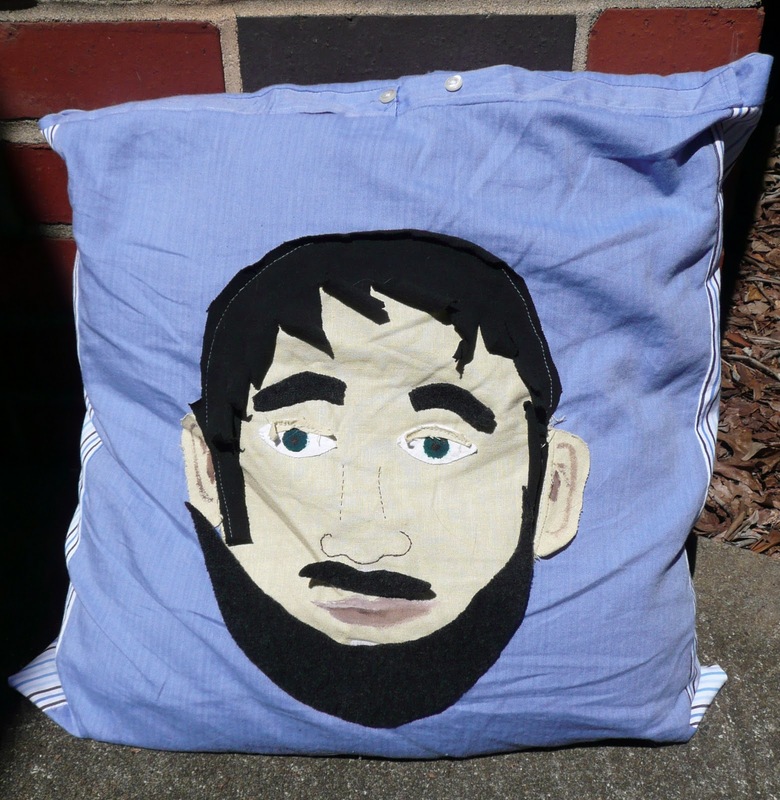 An up-cycled pillow! This side features only the dress shirt, complete with the pocket and the button down front which serves as the opening for the pillow itself. As you can see, it has gotten some use already. 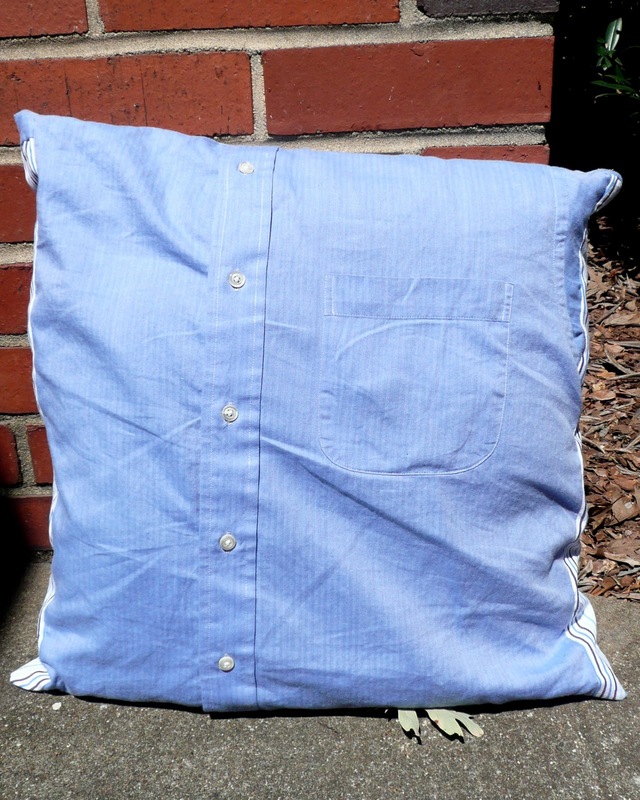 This side of the the pillow is made from the dress shirt as well as tee shirts. The face, hair, and eyes are tee shirts. The nose is stitched with embroidery floss. The lips, irises, and ear details are painted with acrylic paint. The eyebrows are made from an old felted sweater. 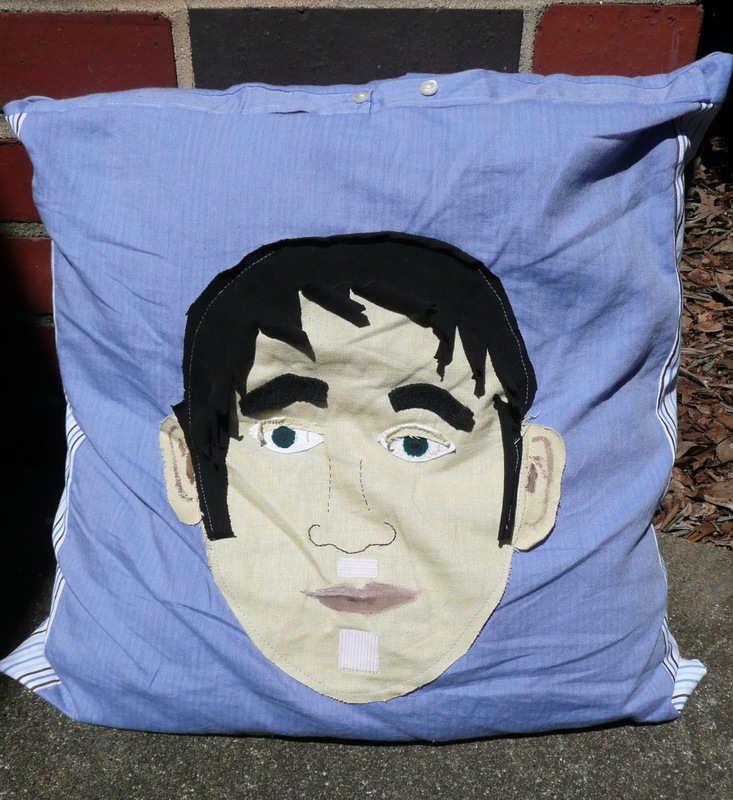 What is the best part about this pillow? Side 2 with facial hair. It has different facial hair styles to choose from! The beard and mustache are made from felted sweaters and are attached with small Velcro tabs. The pocket on side 1 stores multiple beards & ‘staches. He has a handlebar, Fu Manchu, Pencil mustache, and a goatee so far.